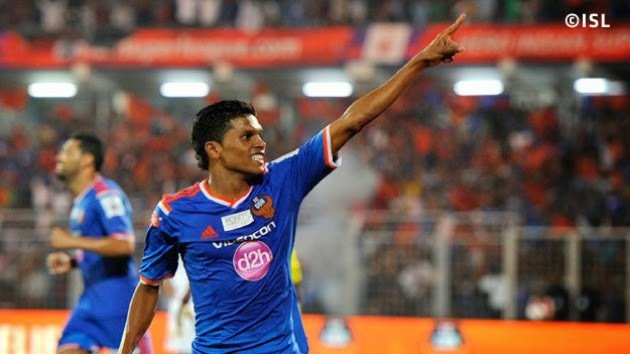 Romeo Fernandes scored the 100th goal of the Hero Indian Super League to send his team on their way to a 3-0 victory over NorthEast United FC at the Jawaharlal Nehru Stadium in Fatorda on Monday night. Goals from Miroslav Slepička and André Santos rounded off the tally as the hosts took a big step towards qualifying for the semi-finals. Goa got off to a lively start with Zohib Amiri nearly gave them an early lead, heading Fernandes’ cross just over the bar. NorthEast, sticking with the 3-5-2 formation which worked well in their previous game against Chennaiyin FC, gradually began to get a foothold with slick passing in the midfield. However, Goa got back in numbers to stifle the visitors’ attacks. They also continued to create the better scoring chances, with star Brazilian Santos flicking a close-range header over with visiting keeper Rehenesh beaten.